Ibrahim waited outside the legal clinic with his most valuable belongings – Syrian ID, passport, a document proving his status as a UN-registered refugee and a notarised pledge promising not to work in Lebanon – all in a crumpled shopping bag. The 47-year-old father of five from Aleppo meets all the requirements for a residency permit in Lebanon, but when he last applied he was told his promise to stay jobless wasn’t believable and he therefore needed a Lebanese citizen to vouch for him. So he did what most others do. He became illegal. A complicated set of laws has made obtaining legal residency in Lebanon so difficult that an estimated two-thirds of the country’s Syrian refugees now lack the proper papers, putting them at constant risk of arrest. Ibrahim chanced it to seek out legal advice, crossing Lebanese army checkpoints on his way through the eastern Bekaa Valley, but found little respite. “The lawyer said there was nothing to be done: either find a sponsor or lay low,” he told IRIN, still clutching the shopping bag. Since the war in their country began four years ago, Syrians have been pouring across the border into Lebanon, and those registered with the UNHCR, the UN’s refugee agency, number around 1.2 million. With the influx came concerns that the Lebanese economy couldn’t absorb the burden of the newcomers, who some also see as a threat to the country’s fragile security situation. In June 2014, in an attempt to stem the flow of refugees and keep tabs on their whereabouts, Lebanon prohibited Syrian refugees from re-entering the country if they visited home. Then, in January of this year, the government introduced a new set of entry and exit regulations for their Syrian neighbours. Syrians who are registered with the UNHCR can now prolong their legal stay in Lebanon for a year, but only if they pledge not to work. Non-refugee Syrians require a Lebanese sponsor if they want to remain in the country. But refugees and aid workers report that some officials from General Security, the government office that handles residency, are not applying the law as it is written. The problem is particularly acute in the Bekaa Valley, where refugees are highly concentrated and are regularly being asked for a local guarantor. The Norwegian Refugee Council, which runs the Bekaa Valley legal clinic Ibrahim turned to, has been keeping tabs on the growing problem. “Most of the refugees I see are illegal, I believe, as a direct result of the law,” said Patricia Safi, a lawyer who provides legal assistance to refugees. UNHCR spokeswoman Dana Sleiman said the agency was familiar with complaints about the law’s application. “Syrian refugees registered with UNHCR have reported varying practices by the authorities,” she told IRIN. 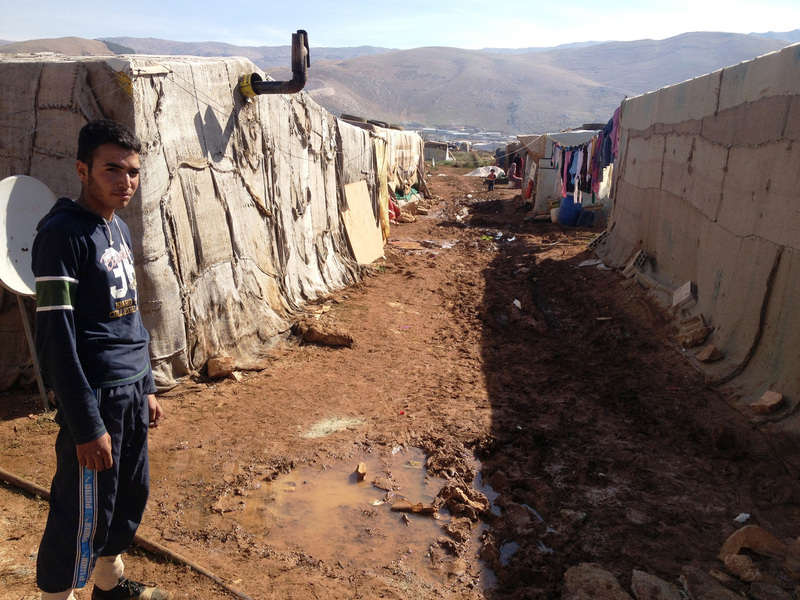 A General Security source in Beirut told IRIN that there might be case-specific reasons why refugees in the Bekaa Valley were being told to find a guarantor. “The General Security officer might have reason to believe [a refugee] is working when he says he won't,” the source said. Safi said many refugees she sees never even attempt to renew their residency because they can’t afford it. The application requires a $200 fee, plus the notarised “no work” pledge and letters from landlords and a mukhtar – a local government official – informing the government where a refugee lives. This can add up to $600, Safi said, and the average Syrian refugee in Lebanon makes $250 per month. The NRC estimates that 35 percent of refugees don’t approach the government because they can’t scrape together the cash. “Residency renewal requirements are prohibitive for Syrian refugees,” agreed UNHCR’s Sleiman, adding that 70 percent of Syrian refugees in Lebanon fall under the poverty line. “Money has been an issue for a long time,” said Hala al-Helou, an official at the social affairs ministry, which handles refugee matters. But the government has no plans to scrap the fee. Instead, Helou said they’re looking to donors who might help front the money for refugees. Erratic application of the residency laws has made it so difficult for Syrian refugees to stay legally that they have had a perverse effect: the government wanted to keep tabs on refugees, but now they’ve just gone underground. “We’re in a situation where refugees can’t work, they can’t go back, they can’t leave their homes, [but] eventually they need to eat,” she said. George Gali, a researcher with the human rights monitoring group ALEF (Act for Human Rights) was of the same mind. "Lebanon is actually making its security situation worse because they are pushing more refugees off the grid by imposing strict conditions for residency," he said. "Refugees can't work, they can't go back, they can't leave their homes, but eventually they need to eat." Those who do manage to sign the pledge not to work are pushed “into a dire economic situation,” he added. Yusra and Safa, sisters-in-law from Hama in Syria who arrived in Lebanon three years ago with their families, are a classic case of what the law has wrought. They’re signed up with UNHCR but haven’t bothered approaching the government about residency. Everyone they know told them that without a sponsor it would be hopeless, and their attempts to find one have failed. Their husbands, Ziad and Ahmed, risk detention every day they go to work as day labourers. They wait on the sidewalk for someone to come by offering work, each bringing home LL 10,000-20,000 ($7-14) a day if they get a gig.